The Royal Exhibition Building and Carlton Gardens represent the 19th century international exhibition movement, showcasing technological innovation and change that was made possible by the industrialisation. The Exhibition Building was designed by the architect Joseph Reed. 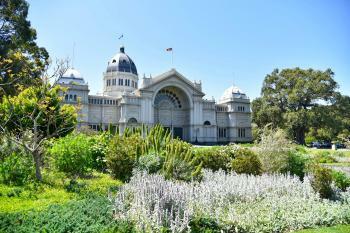 It was completed in 1880, in preparation for the Melbourne International Exhibition. The building consisted of a Great Hall of Industry of over 12,000 square metres and many temporary annexes in the Gardens. 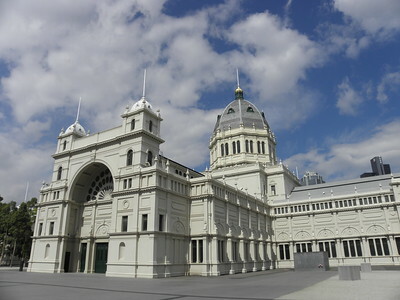 The Melbourne Centennial Exhibition was held at the same Exhibition Building in 1888 to celebrate a century of European settlement in Australia. I am sorry to the people of Melbourne, but this really is one of the least interesting WHS among the 401 that I have visited. In retrospect, back at my hotel room after a site visit of about 15 minutes, I think the worst thing is that no real effort is made to highlight the building or the gardens. 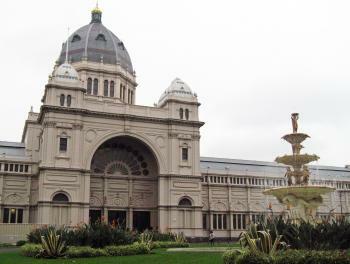 All attention goes to the adjacent Melbourne Museum, currently the venue of a popular Tutanchamun exhibition. The gardens are pitiful. The AB evaluation notes that they are at least of "considerable botanical significance for their collections of trees". It looked like a regular small city park to me, one you can see in every city around the world. The complex isn't authentic. ICOMOS already had a lot of doubts about that, and suggested deferral of the nomination. The building of the main Industry Hall is probably the only original feature left. The northern gardens have been turned into a kids playground, several outbuildings have been demolished. And of course there's the Melbourne Museum, a 2000 addition right in the core zone. ICOMOS doubted it would have allowed its construction if the Exhibition Building already had been a WHS at that time. It is unclear how and when to visit the interior. According to the official website, guided visits can be booked from the Melbourne Museum. I enquired at the ticket office, but no visit was scheduled for the day I was there. The reaction I got led me to believe that these guided visits are pretty rare. If someone has seen the interior (a lot of it has been taken away also), I would love to read a report on this webpage below. The best thing of this visit was my decision to book a hotel in Carlton, close to the WHS. Carlton is Melbourne's Italian neighbourhood. Its Lyston Street has dozens of Italian restaurants, with heated terraces and great atmosphere. I had a wonderful spaghetti scoglio here the night before. I visited this WHS in January 2018 before heading towards the Great Ocean Road. 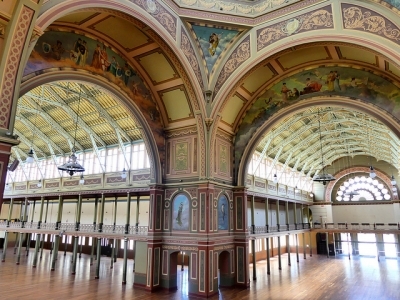 I had prebooked the guided heritage tour over the phone to make sure I could visit the Royal Exhibition Building's (REB) interior. The tour takes roughly 1 hour and runs on most days except when the REB is closed because of an event. If for whatever reason, you're hard pressed for time it is possible to exit the building before the tour ends. Since I drove directly from Melbourne International Airport, the easiest solution was to park in the Melbourne Museum underground parking. The tour starts in the foyer of the Melbourne Museum where I also collected tickets. Usually I'm not much of a fan of the juxtaposition between old and new, however the Melbourne Museum really attracts lots of people and keeps the REB and Carlton gardens area alive. There are several information boards with the UNESCO symbol at the Carlton Gardens and there is a metal post displaying inscription on the WH list just next to the REB entrance. The gardens are a pleasant place to rest on a sunny day and to gaze at both the REB and the modern skyline of Melbourne. There's nothing of OUV in the gardens and they act more as a buffer zone in actual fact. The two fountains are the only two things worth viewing apart from the REB itself. Perhaps it is worth follwing the Golden Mile trail if you have more time. The overall experience reminded me a bit of the Victoria Terminus in Mumbai, India. However, even though the REB tour is much easier to organise, the terminus in Mumbai is much more worth viewing from the exterior. In most great cities around the world, there usually is at least one building that epitomises their spirit and their history. In Melbourne, it's the REB completed in 1880. When it was built it was the highest building in Australia. In 1901 it hosted the first Australian Federal Parliament and the Australian flag was first unveiled in this building and flown above the dome. It is also hailed as Australia's first built cultural WHS. In 1880 and again in 1888, the international exhibitions it housed had a profound impact on the citizens of a city that had existed only half a century. The REB proclaimed to the world that Melbourne was an international city, with the wealth to spend on lavish display, and attracting huge numbers of people. The REB continues to play a leading role in the life of Melbourne, housing exhibitions (the Hot Rod show is the longest running continuous event since 1965), concerts, religious services, banquets, university exams and meetings. The REB evolved in tandem with the city of Melbourne. The 1888 Melbourne Centennial Internation Exhibition was the first exhibition worldwide to offer the possibility of night time viewing thanks to the installation of electric lighting. In 1919, the REB was converted into a hospital to treat over 4000 locals struck with Spanish flu. The royal title was bestowed at the International Centenary Exhibition held to mark the building's 100th anniversary. The building's round arches dominate the interior views with mythological figures and lunettes rich with allegorical symbolism. Nowadays, there are replica gasoliers based on the 1880 design, adapted for electric lighting. When we visited, there were no events and so we could enjoy the building in all its interior beauty. All in all, I enjoyed my visit and the guided tour was very interesting and informative. It isn't one of the finest WHS on the list but I think it deserves its place on the list and is worth visiting if you're in Melbourne. Before I visited Melbourne’s World Heritage Site, the Royal Exhibition Building, I had no expectation after read few negative reviews and I already knew that I had no chance to see the interior since the university booked the building as examination venue for the whole week. I entered this UNESCO complex from the rear side of Carlton Park. This side of the park was peaceful with many lawns and big trees along the pathways, typical English styled garden, actually I quite enjoyed the park as I already gave up the idea of exploring its OUV on botany. Then I saw the gigantic complex of modern Melbourne Museum. Maybe there was no special exhibition during my visit, I did not feel that the museum got more attention from the Royal Exhibition Building. Actually, I deeply impressed the contrast of these two buildings. While I was watching groups of skaters practicing their moves in front of the eastern gates of the Royal Exhibition Building, suddenly all the gates opened and people came out, maybe the morning exam was finally over. Fortunately, I got a chance to peek inside to see the interior of the building! From a quick look the building did surprisingly remind me Wartburg Castle’s famous Sängersaal but much bigger, simpler and more industrial looking. Then I continued to see the famous Hochgurtel Fountain in front of the building. This side of the garden was really lively with many people, locals and tourists. I even saw many tour groups who came for just quick snap in front of the building and go. The fountain is beautiful and really big, maybe the nicest thing of the garden. The exterior of the Royal Exhibition Building is actually eccentric with many styles and I don’t think it is a nice example of this kind of architecture. While I walked around the garden, I met a group of botanical students who came to make report and I did ask them on the botanical OUV of the garden. They told me that the garden actually has large collections of unique local bush trees and wildflowers especially in the southwest part of the garden and the best time to see these plants is late spring or early summer, so in the eyes of botanists, the garden has some value of botany, but in my opinion, those bush trees and wildflowers were just normal decorative plants around the gardens. For World Heritage Site value, I could not easily understand its OUV. Its history with EXPO is nowhere to see, the hall that full with desks for examination made me think of library instead. All in all, Royal Exhibition Building is not a really bad place to visit, but the site alone is not interesting as it should be and there are many places in Melbourne that far better for tourists, but together with the nearby area of Carlton, a lovely place to walk around, drinking coffee and eating in nice café, the visit can be worthwhile. 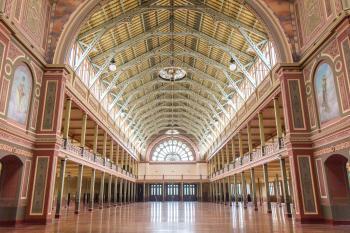 Australia has many iconic sites that have become World Heritage Sites: the Great Barrier Reef, Uluru, the Sydney Opera House; and then it has the much lesser known Royal Exhibition Hall in Melbourne. Had it not been inscribed as a World Heritage Site, I might not have heard about this building when I made plans to tour Australia in June 2012. I appreciate the audacity of the World Heritage committee to recognize the great international expositions of the late 1800s and early 1900s by choosing this site which held the first official World's Fair in the Southern Hemisphere -- quite a feat to pull off in the late 1800s, when international travel required significant time and planning. I've visited what remains of the sites of other great fairs, including those in Chicago, Paris, St. Louis, and San Francisco, so I was looking forward to seeing the inside of this hall. Unfortunately, school exams were in progress my one day in Melbourne, so I was relegated to appreciate the domed building from the outside -- and it was impressive. One day I'll have to return, especially since Michael Turtle's photos of the inside are so fascinating. As for the Carlton Gardens, which are also inscribed, I found them well kept, but rather ordinary. Logistics: The Royal Exhibition Building is easily reached by the free City Circle Tram. This is an incredible building and I'm surprised it's not a more popular tourist attraction in Melbourne. Perhaps it doesn't market itself that well. It was used for several very important events in Australian history - in particular, the opening of the country's first parliament. The way the colour scheme has been restored to the one for that event is appreciated and it has a lovely federation feel to it. The hall is still used most weekends for shows and fairs but I would recommend going on the tour on weekday afternoons to see it without all the clutter so you can appreciate everything a bit better. The building is as impressive as it has to be. It's not a grand cathedral (thankfully). It is as it is named - a relic of the 1800s Great Exhibitions and that it still serves the purpose of hosting exhibitions to this day is very cool indeed. The cultural significance to the nation is largely that from Federation in 1901 it housed the sitting of the Federal Parliament until 1927. It also housed events during the 1956 Melbourne Olympics. And my daughter and I have exhibited there this year at the annual Lego Brickvention. Okay - she and I don't quite share the same WHS significance but to me it's the great thing that it isn't something so austere as to only be admired from a distance. And as Emilia said - visit Melbourne during footy season - go see Aussie Rules footy. btw - the Italian restaurant precinct is Lygon St in Carlton. Contrary to what I read from other reviews, I must say I really enjoyed visiting the Royal Exhibition Hall. This was not in the least due to the fact that when I was visiting Melbourne, the exhibition hall was opened and in use for an annual art expo, so count me a very lucky man. The majestic grandeur of the building and colorful interior were emphasized by the tumult and spirit that the exposition brought along. The interior is beautifully restored to match the original schemes set in 1901 and a must see for anyone slightly interested in design and architecture. I stroled around for almost two hours, enjoying the feeling and awe that 19th century visitors of the Melbourne International Exhibitions must have shared with me. So if you're in the neighborhood, definitely check the calendar for opening times/exhibitions of the Royal Exhibition Building. My visit last week revealed that winter has left the frontage of this site even less inspiring than usual with the fountain surrounded by mud and looking particularly uncared for. And it is unbelievable that there is still a car park at the front of the building. I really enjoyed Melbourne. It gave me very good vibes. But can someone please explain to me why this site was inscribed? I do not get it. I cannot. I tried, but I failed miserably. In a conversation with a person that was born after the The Royal Exhibition Buildings hosted the 1880 International Exhibition, I was told that much artefacts & large works of art were left on site when the exhibition was finished. The "treasures" were so impressive that no one dared destroy or steal them. The person I spoke to, said that he found a way to visit the store rooms where they were kept in 1962. The most impresssive was the Chinese Lacquered timber house. Many of the artefacts were beggining to show wear, as they have not been kept in appropriate conditions. Some of the countries that exhibited, no longer exist. It is another good reason to salvage these items, and put them on show, piece by piece in the building itself. The Royal Exhibition Buildings and gardens were surrounded with very ornate 2.44 metre high cast iron fences & gates, to keep people from the surrounding slum areas out at night. When inner Melbourne was no longer surrounded by desperately poor people the cast iron fences and gates were removed. I believe that was in 1962. The remains of the very ornate cast iron fence is a heavy Basalt stone blocks that formed the base. Much deliberate damage was done to the stonework, but much of it can be restored. I have for many years been trying to get people interested in restoring the stone work, but not many show an interest. I have been hoping that once the stone base has been restored, we can retrieve the cast iron fence and gates from a store room in the western suburbs of Melbourne and reinstall it. This would enhance the site greatly. I would ask anyone with a few minutes of time, to email the Premier of the State of Victoria, and ask for the restoration to begin. There is strength in numbers. What the picture does not show, next to this gem of 19th century hope, the stealing of park land and compromising the World Heritage building and its surrounds. As some one wanted the land the museum was to be build on, they transferred the museum and carpark, a little Disneyland, a few metres away from the "Royal Exhibition Building". We hope the next generation will demolish this attack on the World Heritage building. Finally, a WHS in Melbourne! Melbourne was home for 3 years and it will forever be a special place. I've walked through the Carlton Gardens many times and yes, the building is impressive. However, if you go to Melbourne, make sure you also go to the Queen Victoria Market (one of my favourite haunts). There are too many excellent restaurants to name! Oh, and also check out an Aussie Rules football match. It's a fun time! What a mixture of different architectural styles there are in this one building. A mixture of Romanesque, Renaissance and Byzantine. I was told that from 1902 the building became Australia's Federal Parliament Building, until the new capital was built at Canberra. It is sometimes used for exhibitions again now. ICOMOS suggested deferral, questioning authenticity and integrity of the site.